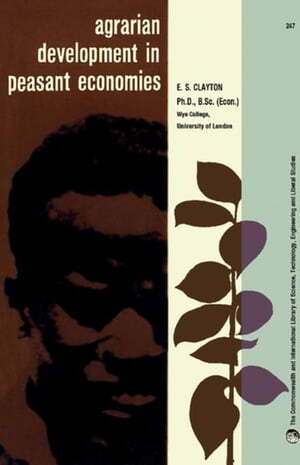 Collins Booksellers - Agrarian Development in Peasant Economies: Some Lessons from Kenya by Clayton, Eric, 9781483138008. Buy this book online. Agrarian Development in Peasant Economies: Some Lessons from Kenya examines agrarian development in peasant, agricultural economies by focusing on Kenya and the lessons that can be learned from its experience. Topics covered include the beginnings of rural progress in Kenya; post-war agricultural policies and developments; the agrarian revolution; and the economics of peasant agriculture. Problems associated with agrarian reform are also discussed. This volume is comprised of seven chapters and begins with a historical background on Kenya's peasant agriculture, paying particular attention to the government's initiatives aimed at increasing agricultural production and controlling soil erosion. The next chapter deals with the country's agricultural policies after World War II, including the implementation of a ten-year development plan and introduction of incentives to improve farming. Subsequent chapters look at the agrarian revolution in Kenya; certain features of peasant agriculture, including indigenous farming systems; the economics of the farm and the agricultural sector; and the policies pursued by the government to achieve agrarian development. The final chapter considers some of the issues affecting agrarian reform, including smallholding and rights of ownership and financing of rural development, in part by taxation. This monograph will be of interest to farmers and agriculturists as well as agricultural and economic policymakers.